We’d love your help. 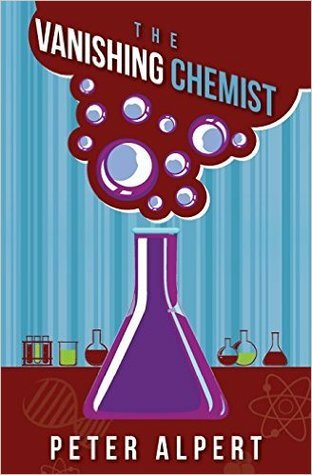 Let us know what’s wrong with this preview of The Vanishing Chemist by Peter Alpert. Greed and opportunity become a volatile mix in retired attorney Peter Alpert’s novel The Vanishing Chemist. Chemist Madison Bellamy first contacts attorney Mark Conover when he faces a $12 million judgement for allegedly polluting Colorado waterways with his platinum refinery. Conover gets the judgment overturned, but he hears from Bellamy again when the eccentric chemist c Greed and opportunity become a volatile mix in retired attorney Peter Alpert’s novel The Vanishing Chemist. Chemist Madison Bellamy first contacts attorney Mark Conover when he faces a $12 million judgement for allegedly polluting Colorado waterways with his platinum refinery. Conover gets the judgment overturned, but he hears from Bellamy again when the eccentric chemist continues his unscrupulous practices in Arizona. That won’t be the last contact. Bellamy’s greed leads him into high-stakes finance deals and takes him around the world in pursuit of cash. Getting governmental approval before he sells stocks is simply a formality that Bellamy doesn’t have time to deal with. What he does have time for is a Bulgarian beauty who joins him in his quest. Throughout it all, he phones Conover, hoping to stay one step ahead of the authorities as he tries to get the pot of money of his dreams. How long can he keep it up? Conover merely wonders as the calls keep coming and he finds himself circling the globe in an effort to keep up with Bellamy. To ask other readers questions about The Vanishing Chemist, please sign up.